Additional Info: Mist enshrouded mountains above dense, rich rainforest, waterfalls and rivers cascade to an intricate coastline. It has a reputation as being one of the world's best destinations for divers, snorkellers, surfers and those who enjoy fishing. The Solomon Islands is a nation in Melanesia, east of Papua New Guinea, consisting of nearly one thousand islands. Together they cover a land mass of 10,965 sq mi. 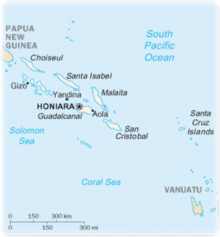 The capital is Honiara, located on the island of Guadalcanal. There are many different SCUBA experiences to be enjoyed in the Solomon Islands: shallow and deep coral gardens with magnificent drop-offs, ledges and gutters, sharks, all manner of light game fish and an enormous range of reef fish. Turtles and, mantas and eagle rays are common sights, together with friendly Hammerheads. Diving is year round with plenty of places to dive in the lee, but April and May are the best months followed by October, November and December. Uepi Point: A near vertical reef corner is coated profusely with corals - especially gorgonian fans and colorful spiky soft corals. At 100ft depths, a coral peninsula juts out into the deep blue, and the walls plunge into the abyss. This provides the stage for a spectacular procession of pelagics including schooling barracuda, jacks, runner, rays and sharks. B O T C H (Bottom of the Channel): A dive directly off the Uepi dive jetty. The dive starts by entering the water at the dive jetty and descending to around 100ft on the wall. Then head out into the passage and you will be confronted with an underwater sand dune that rises about 6ft off the bottom. The sand dune runs along the channel, following the current line, to the Deep Bombies at maximum depth of around 131ft. Visibility at the bottom is often in excess of 130ft. There are many interesting creatures to be found on the sandy bottom including thousands of garden eels waving in the current, sea pens and other sand dwelling species. Often blue-spotted reef-rays and bull rays can be seen gliding over the sand and white-tips sharks resting as eagle rays and sharks glide overhead. The waters between the Florida Islands and Taivu Point on the northeast of Guadalcanal are divided by reefs into (from north to south) Nggela Channel, Sealark Channel, and Lengo Channel. They connect Ironbottom Sound to the west with Indispensable Strait to the east. The area became known as "The Iron Bottom Sound" because of the number of wrecks and debris scattered on the ocean floor from WWII. The violent days have gone by, now the machines and relics of destruction form artificial reefs that attract masses of fish and an incredible variety of coral life. The Solomon's also boast some of the most spectacular coral diving in the world. The ocean is warm and clear, teaming with fish, large pelagics, and hard and soft corals of every color. Dramatic outcrops, breath taking drop offs and imposing coral overhangs add to the underwater spectacle. The Solomon Islands archipelago is part of two distinct terrestrial ecoregions. Most of the islands are part of the Solomon Islands rain forests ecoregion, which also includes the islands of Bougainville and Buka, which are part of Papua New Guinea, these forests have come under pressure from forestry activities. The Santa Cruz Islands are part of the Vanuatu rain forests ecoregion, together with the neighboring archipelago of Vanuatu. More than 230 varieties of orchids and other tropical flowers brighten the landscape. The islands contain several active and dormant volcanoes. Tinakula and Kavachi volcanoes are the most active. Mataniko Falls and Tenaru Falls (Honiara) - The spectacular double-sided Mataniko fall thunder into a cave full of stalagmites, swooping, swallows and bats. During WWII, the cave was a hide-out for Japanese soldiers trying to avoiding capture by the Americans. Tenaru Falls is an hour's drive from Honiara. Hike through the rainforest past local villages which takes about 2 hours each way. The initial climb is steep. Take your time and check out the view. Barana cave, waterfall and war relics (Mt Austen) - a 4 hour round trip (including 1 hour in the cave and 30 minutes at the waterfall). Gifu Ridge is the site of major WWII fighting by one of the toughest Japanese contingents - the Gifu. There are fox holes on the side of the track to the caves and the villagers at Barana have collected dozens of war relics - helmets, bullets, grenades, parts of planes, which they have on display. They have also occasionally uncovered the remains of Gifu soldiers when preparing their gardens. Savo Island and volcano - Savo is a good option either for a day-trip or weekend getaway from Honiara. You can catch a boat out in the morning and return in the afternoon or, instead, camp overnight and return the next day. Although Savo is an active volcano (apparently overdue for its next eruption, in fact), there is no crater that you can stare down into. Instead, one highlight is the mouth of the boiling hot volcanic stream. Guides will often light some dry grass to ignite the sulphur in the air. You will also climb the steep ridge lines to get some great views across to the Ngella Islands and Guadalcanal. Panpipe Music - A visit to the Solomon Islands is never complete without exposure to the poignant sound of panpipe music. The sound comes from blowing into a bundle of different sizes of thin bamboo tubes, open at both ends or closed at the lower end. The player moves his head to blow different tubes with the pipe stationary. 'Are 'Are' pan pipers of Malaita are famous for their pan pipers and a CD of their music will be a treasured gift. Head Hunting Shrines - Solomon Islands are notoriously known for the head hunting marauding tribes with those in western province the most feared. Signs of shrines of this deadly habit still remain to this day. Quite famous for this is the island of Skulls near Kundu point and the sacred Dog stone. Across Munda on Roviana island, once home to ferocious head-hunter Ingava. As the world's largest uplifted coral island, Rennell is home to numerous plants and animals that are endemic to the island. Lake Tenggano is found there, the largest fresh water lake in the south pacific, and home to about 200 islands. The lake is also host to a number of rare orchids.